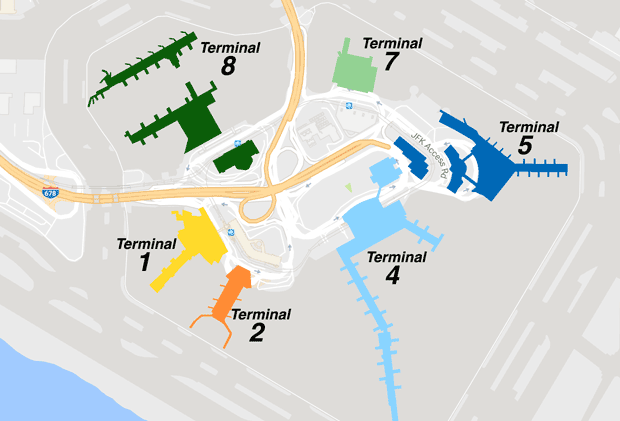 JFK has six operative terminals numbered 1–8, but skipping Terminal 3 and 6, which were demolished in 2011 and 2013 after Terminal 5 was expanded. By the AirTrain system is fairly easy to transfer between terminals at John F. Kennedy Airport, since all airport terminals are connected to its network. Trains frequency is of 2 – 5 minutes. You can also connect to the parking lots, hotel shuttle and rental car facilities. In order to take the AirTrain at any of the airport terminals, you’ll first need to go through security. Within JFK Airport Terminals the AirTrain system is free. Also, between Terminal 2 and 4 there is a free shuttle bus operated by Delta Airlines at their passenger’s disposal.